First of all, I want to thank Makesha Williamson for contacting me to review her book. I'm really happy because I got that chance to read it. So for a while I was out of my YA category this one is something inspirational. Makesha Williamson, born in Florence, SC, raised in Brooklyn, NY. Her mom is a Brooklyn born native. Her dad is a Florence County native. She suffered a very abusive childhood, and has battled with her father being a substance abuser for over 30 years. Which caused her to go through a very confused and challenging childhood. She has made Charlotte, NC her home. She fell in love with the arts at a young age because of circumstances in her childhood, it has become her therapy, and comfort zone. 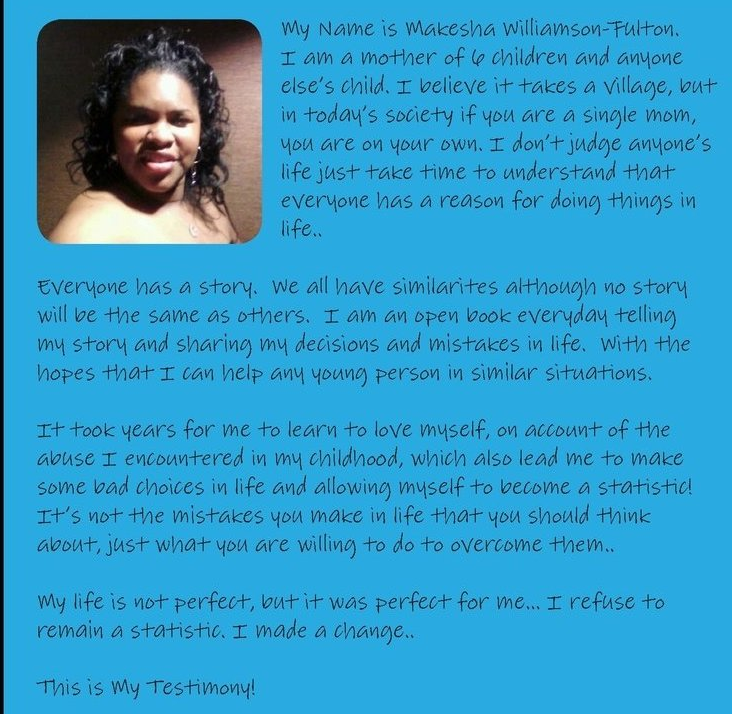 Makesha has written an Autobiography along with several scripts, in which she is working on her first Independent film "Culture Shock Carnival" She loves to share parts of her life that many others have in common, and are afraid to express. Although every one of us has different lives and life experiences she feels there is always a similarity. Her goal is to express understanding within a person's past and for the hurtful things to perish. She wants everyone to understand life with an open mind, embrace other people's culture, life styles, and beliefs without judgment. I just finished the book today and I can still feel the story, it is still fresh in my mind.This book is an autobiography of the author, it tells here what are the things she'd been through. All her ups and downs and how she recover from it. All I can say is "wow" this is very inspirational, her life experienced a lot of down times but she still managed to stand up. She has a strong faith in God. That's where her strengths come from. While reading the book, I was always thinking what will happen to her next specially when she got her first baby, it's awesome because she didn't give up instead she keeps looking on the brighter side. I love how the author writes the story, I don't know how or what to say but for me it's an act of bravery. To write your full life in a single book? It is a brave act. I like how the author acts on every part of her life. The author brings me to her life, while reading it, I was really like listening, what happened to her and all my questions in mind are answered. I love the book so much, it's really inspiring. I would like to recommend the book to other people, you must read it because her life is really inspirational. Personally, I salute Makesha Williamson for being so brave and being so positive. Her life is really a hard one, but she managed to arrange it all. She was able to do all those things that she wanted to do even though there were so many hindrances that comes on her way. I love how she trusted God in everything. She's awesome! Now, as I look at her, I respect her so much. She's a fighter in life and a brave woman. And her book? It is one way to tell other people not to give up, if you guys read it you will know what I'm telling. I hope you guys read it. There's nothing more I can say I got really inspired because of her life, she taught me a lot of things. Thank you Makesha Williamson for that wonderful book! 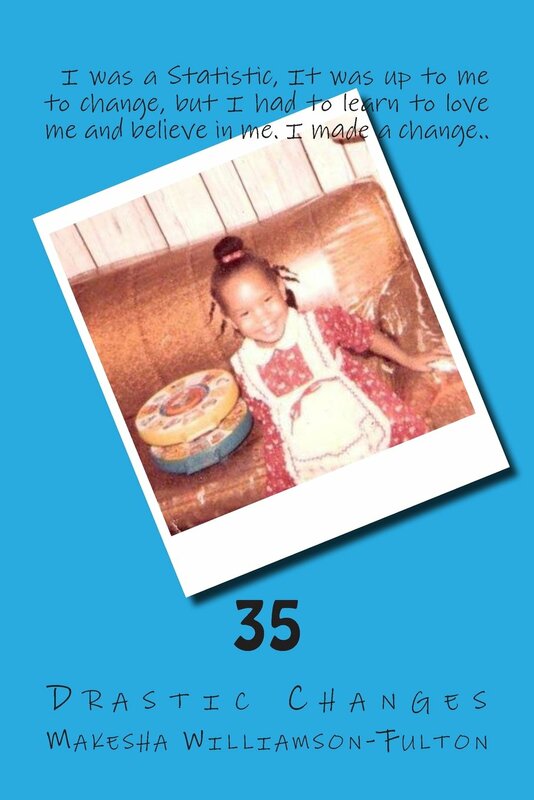 You guys can order her book thru Amazon.com or Barnes&Noble. THANK YOU SO MUCH! THAT IS WHY I WROTE IT TO INSPIRE AND SHOW PEOPLE NO MATTER WHAT SITUATION YOU ARE IN THERE ARE WAYS TO OVERCOME IT!! THANK YOU I REALLY APPRECIATE YOUR FEEDBACK!! I hope you will like my page on facebook too. Great review! I will be sure to check it out and read it sometime soon.